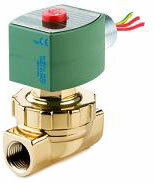 ASCO Hot Water & Steam Valves are built with rugged materials to stand up to the harsh media and the environmental conditions of hot water and steam service applications. These valves are ideal for high temperature fluid applications such as laundries, molding, sterilizing, autoclaves, steam atomization, steam boilers, etc. Normally closed and normally open constructions. Designed for high flow capacity and long life.